Victor Hugo had cried for her in his foreword… And it took a book (“Notre Dame de Paris“) to trigger major restoration works, as the elderly lady was notably suffering from severe erosion to time, history and the elements. What happened last night felt totally surreal. Notre-Dame has survived so many ordeals – human assaults, the hands from time – and during those 850 years (or so), she saw a city grow and thrive. Inside her so many memories. Her world famous bell – le bourdon – became associated with so many events (including the liberation of Paris in 1944) happy or sad… And against all odds, she has been standing in this Parisian sky. Last night, my heart bled at the news, and this orange-grey cloud – flames from her heart, as the 19th century spire yielded to a raging fire that engulfed the forest – this nickname given to those 1300 oak trees that served as timber frame to support that huge slate roof. Like millions of people around the world, I watched powerless, in disbelief, and heaved the following poem, as a tribute or way to cope with shock. ta forêt brûle, ton coeur en flammes! au plus proche des âmes. your forest burns - your heart in flames! a millenium now reduced in ashes. so close to all our souls. Photo credit to Le Monde for both images. Merci. Spring has multiplied signs throught that long and still ice-bladed month of March. If light has reached parity with darkness on the 20th day, and our migrating visitors called at night and settled back in our fields and meadows whilst others pursued their incredible journey north, the island still needs to wake to the promises of the season. March now behind us. Tonight I heard eight puffin scouts have been located west of my favourite headland in our inshore waters. Earlier, friends reported the magical ascending song of a skylark as they wandered by abandoned crofts… Common Eider drakes already sit by their concubines… On inspection of the ground, daisies and bluebells have long braved snow, ice and thaws, re-icing and equinox gales. Even within the perimeter of my sanctuary, the grass has grown and would deserve a serious cut. Spring, voar, so precocious. Eider drake and its concubine reunited at Aith Voe. Light reappears on the 60th North Parallel. I read somewhere that between the two solstices – and more precisely as we approached the Vernal Equinox – we were gaining up to two hours of light every month… Now, as April has entered in the great cosmic ballroom, my sunrises and sunsets are becoming more epic. Strangely enough, fog has already been rolling on from our local hills. “Exotic” and “curious”, for fog remains an oddity before April… February and March both felt odd in places. Yet April promises (or do I really take this for granted?) 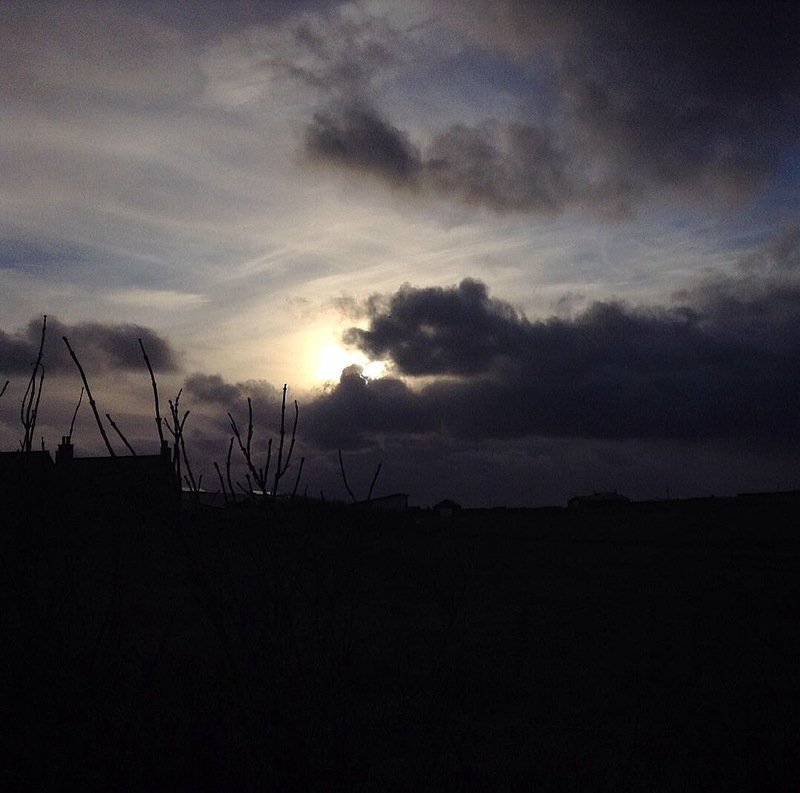 liberation from many claws – storms, gales, and other signatures from the icy months. And if I have yet to listen to my first skylark, I know it will not be long. The sky just needs to quieten a little more and our star to warm up those acres of storm-bent grass around our meadows… Wake, wake, wake, wake! April is when you return to me. The magic of walking to my favourite headland. As I am typing you are gradually falling asleep. Your case is packed. Your passport lies in a pocket of your handbag… Tomorrow, you too will begin your migration north – north by NE, as you will cross that stretch of your Irish Sea to find your way back in Glasgow before making your way to my North Sea from the mouth of a sheltered harbour. We can travel the world like swallows… or Storm Petrels. But to journey, we need a boat. I may not wait for you from my favourite headland on Saturday, But I will gladly watch that great blue Viking efigee on the white hull we call da boat approach my favourite offshore island of Mousa at about 6.30 in the morning and drive parallel to you, as the bow kisses each wave from our sheltered waters. If we are lucky enough, Mother Sea will let you enter the Bressay Sound with grace. It will be your first time. Selkies and seagulls will salute you on your passage. You are about to return to me as seabirds find their way across miles of oceanic deserts, da Roost to reconvene with my headlands, bays and meadows. Now, my turn to find sleep from my northern latitude, as I will be by your side tomorrow, in voice and spirit. I have prepared home to welcome you on my northern island. In anticipation to your arrival, I wrote a piece entitled North Voyager. It sounds and reads like a leitmotive… And yet it does epitomise that promise from Spring. touch you with salt glued on its lips. now you're safe in the Bressay Sound. Only minutes and a pressgang separate us. moder dy: the underlying of the swell used by ancient firshermen as a guide. There is a time when poetics demands music and words to whirl in a shared space. It has happened before and is happening again. Collaboration with Carol Jamieson fae Tresta is flourishing with flair and grace. Already, we have united to offer verse with piano during chosen sessions at Fjara Café-Bar just off Breiwick at Sea Road. Now, we have taken it a step further. Carol is composing and recording her own music, mixing it to my recorded spoken verse. A first piece, entitled Light in Darkness has emerged. It is beautiful. More will be following. Already, the Poet is thrilled with the Pianist’s work. Pot-au-feu is a traditional French dish my grand mother cooked through the crucial seasons of my early childhood. all simmer for a lifetime. Tis the blog’s tenth anniversary and since we start in the dawn of the year, I would like to offer you a string of seasonal haiku penned within these past few years. Bressay bathes in pink & blue. to park their folk into one faith. furtive shooting stars in winter. Brigid’s spirit rises from ice. whatever crescent of the moon. power from the polar vortex. the latest trend in media world. a little closer to Norway. With seasonal greetings fae Nordicblackbird at 60N. With gracious thanks to Lisa and Dereck for that moment. And with gracious thanks to Gail and Keirynn for your renewed homing my work and image. One hundred years ago, a small party of men gathered in a wagon inside a French forest somewhere in Picardy to stop madness and attrition, a futile butchery, unparalleled till then, agree to terms for an Armistice. Humanity defaced, filled with hurt, on its knees. Four years later, on that same month of November, I penned a string of verse to remember you all – irrespective of alliance, skin colour or religious denomination – because you were all human beings turned inhumane inside a theatre of death. You fell or you were shot, because you had beliefs. On this occasion, the following verse is in your honour. Time belongs to lush poppy fields. the name of an empire, country or king. humanity's blood in a flood. Within an hour, I will join all those who remember them at my local beach – St Ninian’s Sands – and read poetry to those clad in a uniform as part of this project #pagesfromthesea because I don’t forget. 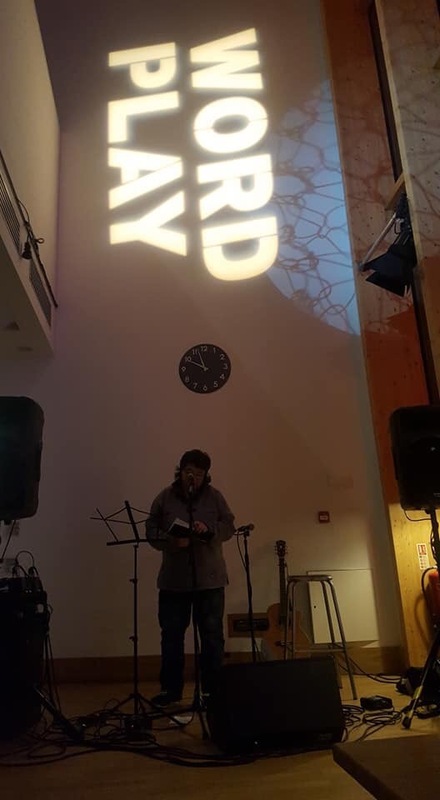 Later tonight, as part of this year’s edition of #shetlandwordplay (the annualbook festival in Lerwick), I will join in for the last event, the Open Mic and read both aloud, as part of a sequence dedicated to #14-18now.